A good ol’ mushroom soup can be a thing of pure beauty, and in the colder months an almost religious experience. This rich and complex recipe has been a favourite of mine for years. I think it might become one of yours too. Click for recipe. Let’s get spring moving already shall we? Bright, bold, spring flavours, only takes 15 mins… and it’s all vegan. The gals love it and I love. I think you will too. Click for the recipe. A no-brainer to make but gosh darn is she a deliciously complex thing. And like most of life’s loveliest things she gets better with age… perfect the next day and even the day after. Click for the recipe. When you’re craving mom's chicken soup but your mom isn't Asian and she never made chicken soup anyway and if she did you might not have liked it. Click for the recipe. This cozy, soul warming, 15-minute one pot wonder is a popular mid-week go to at my place. The girls don’t mind the hint of chili but you might wanna tweak it for your gangs taste buds. Click for recipe. Inspired by the first soup I ever learnt to cook as a young budding chef the creaminess of the squash and gentle sweetness of the roasted apple feels like a warm hug on a cold day. Click here for the recipe. Shrimp Bok Choy - FAST! An quick action-packed Asian dish that takes 3 mins. You can swap shrimp out for virtually any meat (meatless is also awesome). Click for the recipe. Called "drunken pie" because it's so easy you can make it drunk. Booze is optional (& it cooks off) so it's great for kids. Click here for recipe. When it comes to bright, bold flavours Southeast Asia is my go to… and it doesn’t have to be complicated or time consuming. Click here to view recipe. Big hardy chunks of beef with al dente barley makes this dish a complete meal. Toss in a fresh baguette, a lashing of butter and a glass of big bold red and you’ve got all your food groups covered. Click to view recipe. Paella is the perfect keep-them-all happy dish. Something for everyone and it’s also a great one for experimenting with a super wide range of meats, veggies and seafood. Click here for the recipe. If 800 thread count Egyptian sheets were a soup this would be it. A special occasion soup, and by special occasion I mean anytime you want a spectacular soup. Don’t get caught on the truffle, you just need a little bottle. Click here to view recipe. I love one-pan meals, especially when you’re half awake, cranky and tired. A play on the classic paella, baked eggs are soul-warming anytime of day. Click here for the recipe. Flesh & flora lovers can finally unite at one dinner table with this hearty fare. Click for the recipe. A classic dinner reinvented w lighter, BIGGER flavour & shhhhh, healthier. Click here for recipe. A REVOLUTION in healthy soup; Blend ingredients THEN heat them up. Takes 4 mins! Vegan/gluten-free! Click here for recipe. Why I love Asian inspired dishes... enormous flavours & simple. Click here for recipe. This satiating soulful dish will make you wanna cozy up under a blanket and fire up Netflix. *Leave out the sausages and it makes a great lentil stew. Click here for the recipe. This soul-warming simple soup is a celebration of in-season tomatoes. Salty feta and a hint of spice is the perfect platform for rich tomato goodness. Click here for the recipe. 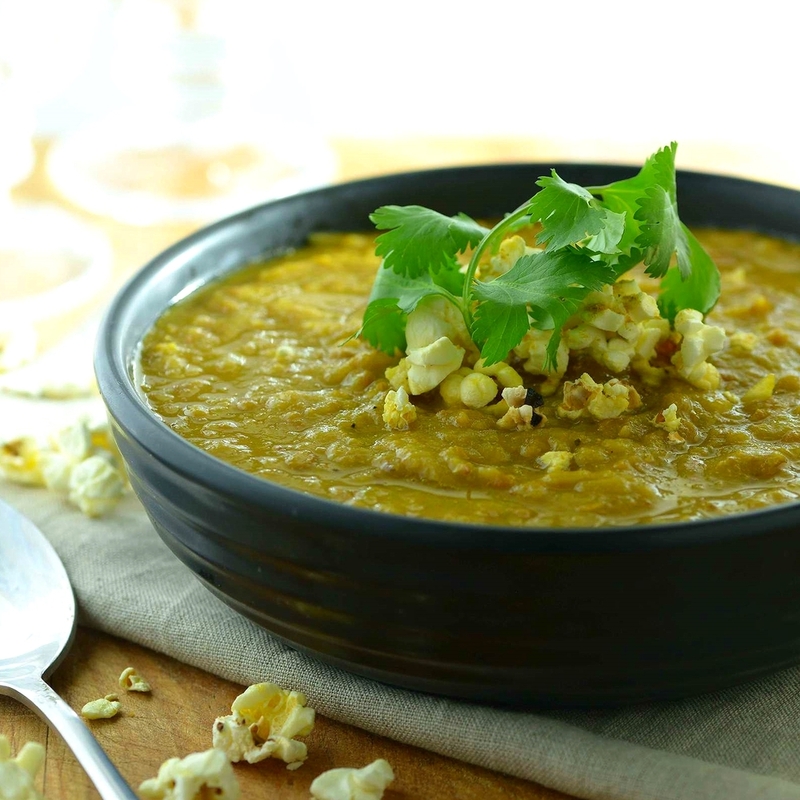 What happens when you take French onion soup, add lentils, spices and top with buttered curried popcorn? ... This heart-warming hardy bowl of culinary confused deliciousness. Click here for the recipe. STILL HUNGRY? Subscribe for more tasty recipes, tips, tricks & updates.